For a few minutes on Saturday, I was related to The Pilgrims. Not just, related. Descended. Directly descended via my 8th great grandfather, an original passenger on The Mayflower. 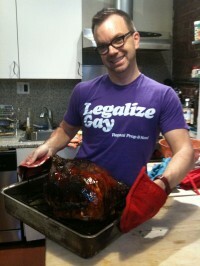 Suddenly, my crazy love for Thanksgiving all became clear. Why had this been kept from me my entire life? How did my mother not know that her family held such mythical importance in the founding of the country? And then, in an instant, my claim to American legend dried up, a sleepy clerical error made on my part as I trolled the boards of Ancestry.com at two in the morning. One of my guilty pleasures is NBC’s Who Do You Think You Are?, the Lisa Kudrow-produced schmaltzy dramatization of celebrities discovering their ancestry. While I feel like the show is predictable and not particularly well done, I can’t help but watch. For some reason, seeing Rosie O’Donnell visit the Irish workhouse where her family barely survived the potato famine gets me every time. So with Chef away at a conference, I decided to kill some time logging onto the show’s sponsor Ancestry.com to see what I could find, and within minutes, I was hooked. 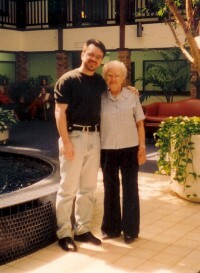 Last picture with Mama; should have asked her about ancestry! My family has never been one to talk about our heritage. The Buchmeyer’s like to leave it at one famous story about great, great half-uncle Henry Lehman being kidnapped and raised by the Indians, and if pressed, will reluctantly admit that a branch of the tree relates us Richard Nixon. My mother’s side of the family has been even less forthcoming. When asked, Mom always replied, “Oh, there’s really nothing interesting there. Don’t worry about it.” I took that to mean don’t dig too deep—they were probably some of the original prisoners at the penal institutions in the Colonies. But within minutes of setting up an account on Ancestry.com, I was hot on the trail of the truth. The whole thing seemed so easy. The site gives you hints and clues, and access to other family trees that might include your relatives. Mother’s family traveled back through Tennessee and Virginia, and the further back in dates I went, the further up the Northeast I traveled. Until I realized we were in the 1600s in Plymouth. Plymouth?! Holy Thanksgiving. And there, presented to me, was an excerpt from The Mayflower’s manifest showing my 8th great grandfather onboard. I couldn’t sleep all night. Tossing and turning. Excited and also frustrated with my mother. How could she withhold this? 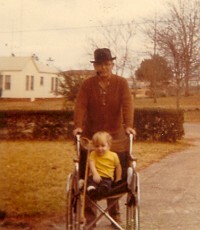 Last picture with Papa; descended from Pilgrims? After I excitedly spilled the Thanksgiving beans to Chef by phone, I decided I better just double check my facts before accusing my mother of historical ignorance. Things could get ugly after all. It didn’t make sense to me that no other member of her family would have checked the records, or be on Ancestry.com. I searched for some of her family members, and sure enough, Uncle Bill, married to my Aunt Lou, had been conducting his own research and done a good amount of work on my mother’s family. Looking at his tree, I noticed a dramatic difference—the family seemed to hail from North Carolina and just ended. No surge up through Massachusetts ending at Plymouth Rock. Uncle Bill must be mistaken. And then I saw my simple error. I had chosen the incorrect records of a man with the same name as my great grandfather—they lived one county over from each other in Texas. My Uncle had the right guy, no doubt. With one click of one button, I had invented an entirely incorrect—yet thrilling to believe—ancestry for myself. I had willed myself into being a character on Who Do You Think You Are? Thankfully, I hadn’t called and accused my mother of historical wrong doing. My Pilgrim dreams dashed, I couldn’t get anything done the rest of the day. I took to my bed and pulled Frida close, consoling myself that it was dramatic enough to have a half-uncle raised by Indians and a discredited President. But my mind wouldn’t rest. Why had my Uncle stopped the search in North Carolina? Surely there had to be more information about this John Wilbanks who was born in North Carolina in 1716. When I raced back to my computer and pulled up the family tree, alas, there was no icon of a little green leaf floating by his name—an indication from the site that they have a clue or hint for you. Damn. Maybe the trail was cold. But there was a leaf flying next to his wife Patricia. One click revealed that while Patricia was born in North Carolina, her parents hailed from New York. And while there wasn’t much about her father, there was quite a bit about her mother Maria, whose last name is Dyckman. That’s a famous Dutch name that harkens back to the original settlers of New Amsterdaam—I was back near Pilgrim territory! Turns out, my 9th great grandfather Johannes Dyckman had been the first clerk to the West India Company, coming to the area in 1651, serving for awhile in Albany—but according to records “was laid aside by insanity” in 1655. His son Cornelis moved the family to Harlem in 1694, and was made constable in 1698. He eventually sold the land in Harlem, and bought a large estate in Bloomingdale, and is an ancestor of that famous family as well. During the time in Harlem, his daughter Maria, my seventh great grandmother, married James and moved to North Carolina—for reasons I can’t quite figure out. Whew. Now, so many things are clear to me: love of Gouda cheese (Dutch roots), love of shopping (Bloomingdale connection), and my love and lifelong desire to live in New York City. Oh, one more thing, my current home in Washington Heights was evidently once part of great grandfather Cornelis’ estate. That all makes me feel a little better about not being a Pilgrim. Sure, I should probably go back and double check all the connections. But for now, that’s my ancestral story, and I’m sticking to it. 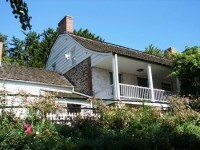 This entry was posted in 40, Love, Featured and tagged ancestry, ancestry.com, dyckman, dyckman farmhouse, mayflower, pilgrims. Bookmark the permalink.